Here are my Top 10 Chiller thrillers published by Female First. Not only will these novels chill your blood. They are also set in the chilliest of locations. This is a tense psychological thriller and mother-daughter story set in Northern Alaska during the winter of permanent night. Yasmin and her deaf daughter Ruby put their lives at risk to search for Yasmin’s husband and Ruby’s father whom everyone, including the local police, believes to be dead. This is the fifth novel in the Harry Hole detective series to be translated into English. I particularly like this serial-killer story and its eerie, wintery setting in Oslo. Harry Hole is a flawed and fascinating character and the plot is full of twists that keep you guessing> But be warned, it is a little grizzly in places. In a small Swedish town a young girl, who has been missing for a while, is found. She has been subjected to terrible torture and she is not the only victim. The detective, and his wife, a writer, find themselves trying to solve the same crime. This book has a great plot twist at the end. When Lo, a failing journalist, is given a chance to redeem her career on a luxury boat heading for the Arctic, little does she expect to witness a murder. Or does she? Lo finds herself isolated and in danger because nobody believes her. She must find a way to overcome her inner demons if she is to discover the truth and stay alive. This fast-paced Antarctic thriller introduces the character of US Marine, Shane Schofield (Scarecrow). The book has non-stop action, adrenalin-charged battle scenes, strange sea creatures, and dark secrets beneath the ice. 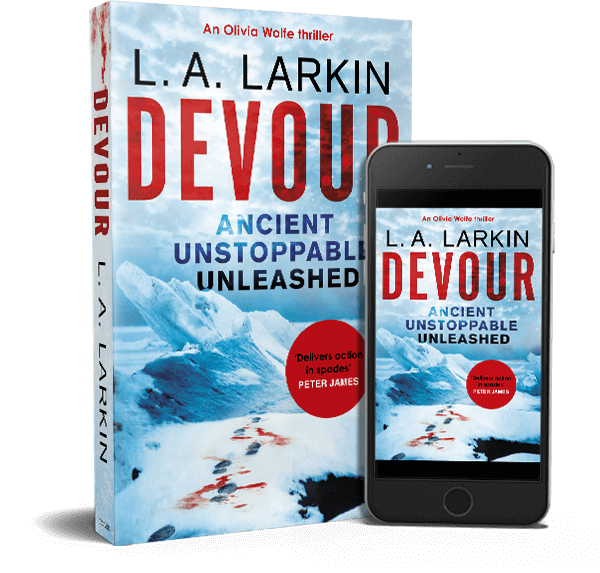 Action, adventure, mystery, suspense, this nail-biting thriller takes you into a terrifying subterranean labyrinth beneath Antarctica’s ice, where an entire civilisation once lived and where killers lurk. One of the first Scandinavian thrillers to become a best-seller, it is atmospheric, subtle and beautifully written, with unusual characters, especially the fascinating Smilla Jaspersen, who sets out to prove that the accidental death of a little boy was, in fact, murder. This is a masterful thriller set on a Russian factory ship in the middle of the icy Bering Sea in which a disgraced Russian detective, working on that ship, is commanded by the ship’s captain to solve the murder of a female crew member. Sinister and dark, this thriller will have you afraid to turn out the light. I hesitate to include one of my thrillers in the list, but you can’t get chillier than this story of destructive greed in Antarctica. An isolated research station is under attack. What is the secret that must be kept at any cost? Can one man, with nothing but his survival skills, stay alive long enough to prevent a global catastrophe? This series of three books which kicks off with The Girl With The Dragon Tattoo is a must-read not only because of the damaged but brilliant hacker character, Lisbeth Salander, but because it is full of spine-tingling suspense. My favourite in the series is book two, The Girl Who Played with Fire.